There’s been a Battlestar Galactica sized hole in my heart since 2009 when the SyFy network (then known as Sci-Fi Channel) aired the last episode of what is arguably the best science fiction show of the 21st century. Science Fiction is my genre of choice, and I consume more TV and movies within that genre than anything else. But nothing quite lived up the standards BSG set for me… until now. 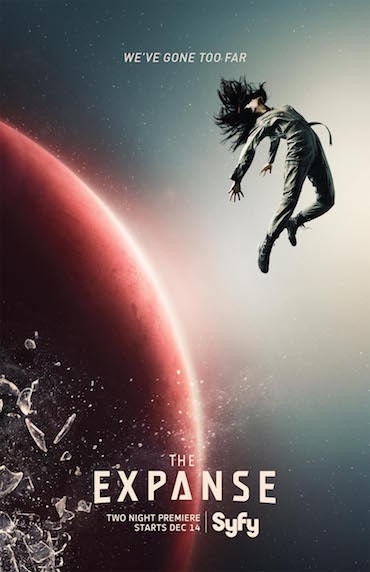 The Expanse has brought back the realism, the grit, and the drama that’d I’d been craving for the past six years, as well as adding in some extremely accurate science (a rare bonus in heavy sci-fi shows!) and a universe that I could actually believe could be our future. I first noticed The Expanse at San Diego Comic-Con 2015 when they took over an entire restaurant in the Gaslamp District, turning it into The Expanse cafe, but honestly so much goes on at SDCC that it barely caught my attention at the time. My website was also lucky enough to be able to sit down with them at New York Comic Con, which hooked a lot of my writers right away. It was harder for me to get drawn into it, though, and it wasn’t until the network decided to drop the first four episodes early right before Christmas that I gave it the attention it so obviously deserves. The show immediately shot up my list of favorite currently airing shows, becoming the only thing on TV in December and January that I was actually looking forward to on a weekly basis. After the conclusion of the first season, I once again felt a tad empty. But good news, friends! The show has been renewed for a second season and you should definitely catch up as soon as possible so you can be stuck in this hiatus misery alongside me as we wait for the second season. The basic premise is that humanity has expanded off of earth and onto the moon, Mars, and various places around the asteroid belt. The political lines have been drawn into three factions: Earth and the moon on one side, Mars on its own, and the “Belters” all lumped together. Each faction has its own culture, government, and even their own physical traits unique to them and them alone. Those who were born and raised in the belt tend to be very tall and thin due to growing up in low gravity. They also speak with a sort of pidgin language that’s become hard for outsiders to understand. Mars, on the other hand, has become a huge military power and very focused on expanding its power. Earth and the moon seems to be where a large portion of the solar system’s wealth is, along with an ingrained superiority towards the other factions as they are from the place where humanity began. Things are tense already, but the events in the pilot episode set off a string of events that could send the entire galaxy into war. The show primarily follows three groups of people as it weaves this complex narrative together. The first plot thread belongs to Detective Miller, a Belter who’s hired to investigate the case of a missing earth girl named Julie Mao. Julie is the daughter of one of the richest people in the galaxy, but has chosen to leave Earth and join the OPA, or the rebel Outer Planetary Alliance, that fights for Belters’ rights. It seems straightforward at first: rich dad wants his rebellious daughter back home. However, the mystery goes so much deeper than that, and each episode escalated it beyond my wildest imagination. This plot alone would have hooked me, but it’s only the first plot thread of the three that keep this intense narrative plunging forward at full speed. The second plot thread involves James Holden, an earther who works on an ice hauler in deep space. As they are en route to make a delivery to Ceres station in the Belt, they get a distress call from a ship called the Scopuli. Most of the crew wants to ignore it out of fear that it could be a trap, but they end up being forced to investigate the call and perform a rescue operation. Like Detective Miller, Holden gets thrown into an interplanetary conspiracy quite by accident right from the pilot episode. For me, Holden’s plot was by far the most intense and knuckle biting of them all. It thoroughly explores concepts of morality, survivor’s guilt, love, life, and death to an extent rarely seen in short season TV shows. By the final episode, none of the characters involved in his arc are what they were in the pilot. There’s dramatic character growth all around and I’m excited to see what the next season brings for his crew. The third story revolves around Chrisjen Avasarala, the Deputy Undersecretary for the United Nations, which is the primary government for both Earth and the moon. She is a complex character, with both a harsh edge to her and an incredibly warm, yet rarely seen motherly instinct. She provides the primary perspective for what life is like back on Earth after much humanity left it for other parts of the galaxy. The politics can drag at times, but even the ‘boring’ scenes provide glimpses into the mysteries that have plunged our other two main characters into situations that are far above their heads. The pleasant environment on Earth also provides a contrast for the harsh reality of deep space, too, which really highlights just how dire things are in Holden and Miller’s situations. The second season can’t come soon enough for me. I know I’ll probably watch the show from beginning to end several times before the next season’s 2017 release date, but I just can’t help it. It truly is the best science fiction show since BSG, and I’m grateful to SyFy network for giving such a daring plot a chance to thrive on television. Editors note about the author: Angel_ is a member of the FoCC forum and Admin for the Geekiary. Click on the link below for the thread on the FoCC forum to join the conversation or see what others are thinking.